Supermodel Naomi Campbell, rocks timeless biker style, in a vintage editorial. She adds a dash of yellow to liven up her black leather pants! Shala Monroque (right) – Editor-at-Large at Pop Magazine , was snapped at Calvin Klein Spring 2011 in New York; Sporting a fringed leather skirt, which she teamed with the limited Naomi Campbell t-shirt by D&G. 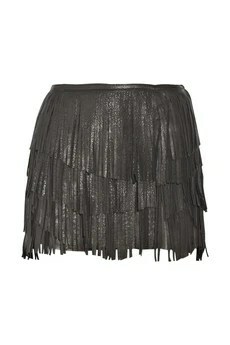 We found a close match with Isabel Marant’s fringe leather skirt. Shala is clearly in tune with the trends and wears high fashion very well; she was recently photographed in a stunning Mary katrantzou S/S 2011, at a Vogue party . 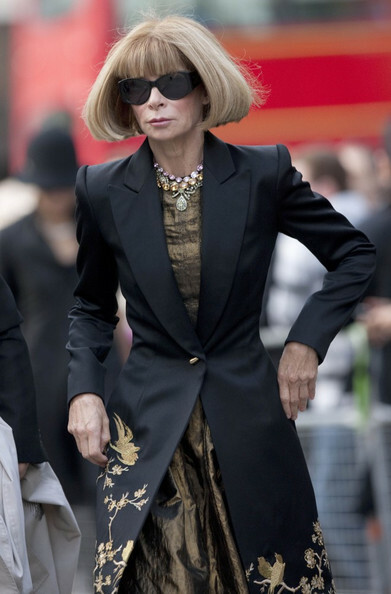 Follow her amazing style at her blog, Vogue.it and Harper’s Bazaar. The best of the supermodels: Cindy Crawford, Claudia Schiffer, Helena Christensen, Karen Mulder, Linda Evangelista, Naomi Campbell, Stephanie Seymour, Tatjana Patitz for Vogue US September 1991 behind the lenses of Peter Lindbergh. 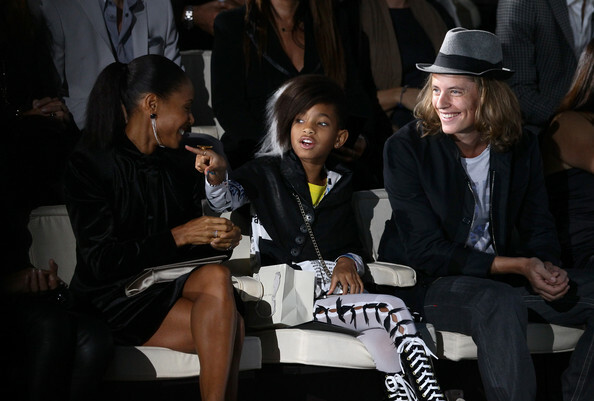 Day 1: A typical day out with mum Jada Pinkett Smith; Willow Smith (left) briefly stops to greet fans on her way to Milan Fashion Week Spring/Summer 2011. Day 2: Willow (centre) trend-forecasting with the hunky Pierre Sarkozy (right), front row at Emporio Armani. Day 3:Willow front row at Dolce & Gabbana listens attentively, as the glamorous Naomi Campbell (right) offers golden advise on Catwalking. More pictures of Willow here. The Naomi Campbell T shirt : is a limited-edition ,in honor of Supermodel Naomi’s 25 year, career in the fashion industry. The collection comprises of 14 different designs, displaying iconic images of the supermodel taken by the world’s most famous fashion photographers, including Patrick Demarchelier, Steven Klein, David LaChapelle, Mario Testino, Ellen von Unwerth, Bruce Weber, Steven Meisel, Herb Ritts and Peter Lindbergh. All proceeds from the sale of these limited edition T-shirts, will benefit Campbell’s ‘Fashion for Relief’ charity, which raises funds in the fashion world in times and places of need. 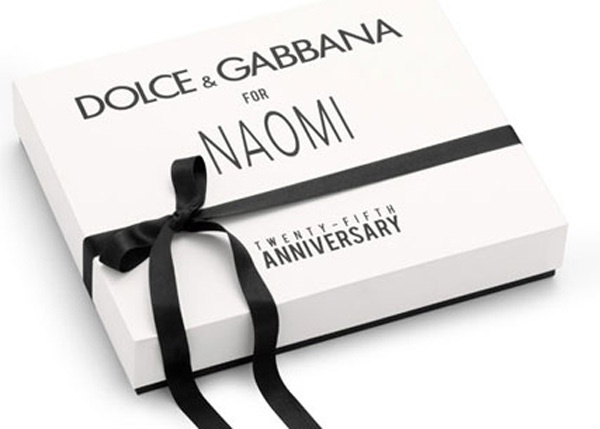 Domenico Dolce and Stefano Gabbana launched the Naomi Campbell T-shirts at Fashion Night Out 2010. The Italian design duo continue to champion their love for the ‘Naomi Campbell’ brand, which has seen the supermodel front numerous D&G campaigns, runway shows and one close to their hearts, a luxurious Naomi room, at their villa in Stromboli.